This entry was posted on January 12, 2012, 4:12 pm and is filed under Cool Videos, Networking, Operating Systems, technology. You can follow any responses to this entry through RSS 2.0. You can leave a response, or trackback from your own site. I’m having what seems to be precisely this issue, but am wondering if you can elaborate. How can I check this and what sort of specific credentials do you mean? “I’m using serviio to stream my pc files to my new Sony BDP-S790. All the folders shared and were populated successfully on the Sony, except for all of my mapped drives. They show up in the Serviio browser list on the S790, but are empty. It says “no playable files”. I have a desktop computer with multiple external hdds attached, and access these through my laptop with mapped folders. I haven’t been able to find instructions on how to resolve this problem. Is there some other way I should input the path? I’ve double and triple checked my sharing and security settings on the remote computer and all seems fine there. In addition, I’ve always had these folders mapped to the laptop so there has never been any issue accessing them. Also, I had no trouble setting up these folders with the PS3 Media Server I used to use…but I really prefer Serviio, and would hate to go back. It will take the name (I’ve found that if I input a name that doesn’t exist or is somehow wrong, I’ll immediately get an error and be unable to apply), but once I restart serviio with that new username, I get error: 1069. So I have to revert back to local system account. I’ve checked and unchecked “allow service to interact with desktop” and that has made no difference. Then I thought maybe the user name I need to enter is the one on my remote computer, since that’s where these problematic drives and folders reside, but it wouldn’t accept that user name at all. Those four are all the same drive. If I get the address by going into the drive via mapped, I get the the I:\ address. If I go into the drive under network, I get the \\LION\My Book (L) address. This is just one example–applies similarly to all my mapped/remote drives/folders. I always force refresh afterwards and wait to see if files will start adding, but they never do. I’ve even left it alone for several hours to see if it at some point will start to add, but again nothing. And I’ve found one additional problem. In at least one of the folders that I successfully added to serviio and shared to the S790, at least half the files within are not showing up. There are multiple subfolders within that larger folder–lots–and I wonder if that’s the problem. Is there any limitation with folder depth or something similar? I removed the folder where I noticed this problem and am in the process of re-adding it, which takes some time. I’ll know soon if that solved the problem. Otherwise, another mystery to me. Update: No luck re-adding that folder. The majority of subfolders within the larger folder are still showing up empty. “There is no playable file.” The files within are absolutely supported by serviio and the Sony, it’s just not reading them or adding everything. My laptop is running Win7, x64, Ultimate. Desktop is x86, running XP. The remote drives connected to the desktop are an Acom and 2 WD’s. Running Serviio Pro v. 1.0.1 trial period (evaluation license) here on the laptop. Laptop and desktop are in HomeGroup. If any further info is needed please let me know. Another thing to try is changing the name of the share, removing the open/close parenthesis. If the service is running with your credentials and you have the share mounted with that same user, you should be able to add the location and get it to work. Does your laptop user have write access to the shares? I don’t believe serviio needs it, but I could be wrong. So if that’s the case, you may want to grant write access to your laptop’s use for that share on the desktop. My desktop does not have a static IP. If needed, I will set that up. In the meantime, I figured I could at least input the IP as it is now, which is 192.168.1.105. Therefore, I think, the path would be \\192.168.1.105\My Book (L). Tried it but getting the same results. The folder shows up on the Sony, but empty. “There are no playable files.” Now this message does not actually mean there are no playable files. I can confirm that the contents of this folder are no different than any other LOCAL folder which has been shared successfully. It just means that it’s not finding the content, ie, something’s still wrong with the way I’ve set it up. If simply entering the path as it is, without creating a static IP, is not going to work, thereby making my test pointless, please let me know. On the laptop, which is where I’m running everything, I have only one user account, and it is an administrator account. Therefore I assume that the mounted drives and folders have been shared with the same credentials. My laptop admin user, which is Wolff, has write access to the shares. I found a bit of information in the help section of another DLNA server called TVMobili. I ended up junking it because it really didn’t serve my needs. However, I do believe that their specific instructions for setting up mapped folders would apply universally…I just don’t quite understand what they mean. So I’d like to share that with you, and perhaps it can be of some help. 1) Open Control Panel->Administrative Tools->Services and right click on the tvMobiliService in that list. 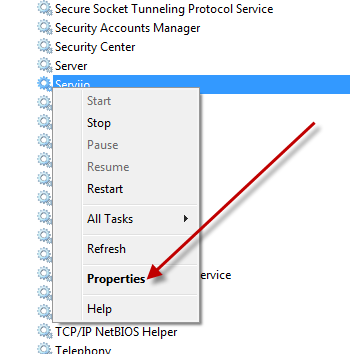 2) Choose ‘Properties’ and change the logon account that the service uses to be your own personal logon account for Windows. 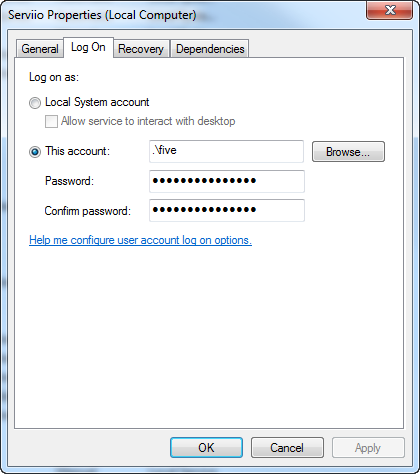 4) Ensure that there is a user on your NAS box that is EXACTLY the same as your Windows user account. Most NAS boxes provide you with an admin interface to accomplish this. 5) Use the full UNC path (\\sever\share) to add the NAS box into TVMOBiLi. As I mentioned, I tried steps 1-3 before, without luck. It’s step 4 which is new information to me, and I’ve attempted to follow that bit of direction, but I’m a bit confused by what they mean. Here’s what I did. I went to the desktop and created a new user with admin rights, called Wolff. Same as my user name on the laptop. I then went to the My Book drive and added Wolff as a user with full privileges. Full control, with all check boxes checked. Then I went back to steps 1-3, trying to add Wolff again as the logon user for Serviio. Still no dice. I get the same error: 1069. One thing I could add to that is that in windows there are two types of permissions when it comes to network shares. There is the normal filesystem permission that you add to folder in regard to local users and then there are share permissions. Make sure that the user that is accessing the shares from the laptop has write permissions on the share and folder levels. If all else fails, give Plex Media Server a try. That’s what I use now, and I absolutely love it. I forgot to mention…Though they refer to a NAS box, the topic for their instructions was Adding Content From a Network Share/NAS Box. So I think it should apply to a network share as well, not just the NAS box. And just to be precise, I’m trying to apply these instructions to Serviio and not TVNMobili, so just swap the names. Thanks. Hmm, thanks for the super fast response. Let me analyze that, lol. As to the second part, I’ll definitely try Plex. But I think the problem lies elsewhere. So far, no kidding, I’ve tried TVMobili, XBMC, Twonky, PS3 Media Server, and of course Serviio. Also, I’m tech savvy only to an extent. Networking, share, permissions…well I’m a bit lost there. Need to spend some time figuring out your comments about filesystem vs share permissions. On your desktop, browse to the folder that you have shared. Right-click it and choose “Properties”. There’s a “Share” tab and a “security” tab. The share tab lets you set up the share including it’s share permissions. The security tab is also important because you have to add permissions to the actual folder for that user. Also when you access the share from your laptop, does it (or did it ever) prompt for a user/pass. I’m wondering if you are accessing the folders as a Guest account and only have read permissions. As a quick test, try to create a text file and save it to the shared folder (while on your laptop). Yes, I’m able to create and save files in the shared folders from the laptop. Just tested. OK, I see something weird under the share tab. The Share Name is L$. There’s a drop down box where I can select My Book (L). But it won’t take. IE, if I choose that name then save, it reverts back to L$. That L$ name doesn’t appear anywhere on the laptop. It also says that Windows firewall is allowing this folder to be shared. Administrators (LION\Administrators) Lion is the administrator account on the desktop. Wolff (LION\Wolff) Wolff is the user account I just set up on the desktop, hoping (refer to the TVMobili instructions #4) to somehow mirror the account name that is on the laptop. I’ve just given full control to every account except CREATOR OWNER. The only box that can’t be checked is “special permissions”. I just tried out Plex Media Server. Bizarre program–it opens full screen and renders my mouse inoperable. Also has no settings for adding folders or anything. It looks like they have product specific versions of their app, for LG, Samsung, GoogleTv, but nothing for Sony. Strange…plex uses a web frontend and is a straight up dlna server so it should work with anything. Found a setting to enable mouse and have it appear windowed instead of fullscreen. Progress. Now just trying to find the area to add videos and folders. Sorry, I see no way to have Plex show up on the Sony, and therefore the TV. It doesn’t even show up in services–where I looked to see if I had to start up the server. All it seems to be is a media player, for the pc. Yeah I’m not sure what you are using but it sounds nothing like PlexMediaServer. Could be my mistake. I installed the plex media center, but not the plex media server. Doing so now, and will update you as to any progress. Thanks again for all your help. I hope you might continue to assist me with the mapping issue. Plex Media Server is running. I had to enable the specific port in the router, but once I did that it showed up on the Sony. I began by adding folders that were mapped. They’re showing up, and so are the contents. A great start. Unbelievably, this brings up other issues though. Namely, file support and transcoding. Serviio was amazing because it handled every file type I threw at it, and they played back beautifully on the TV. I’m finding already, with a very limited number of folders and files currently updated in Plex (this is going to take a lot of time to update my thousands of files, but I expect that) that some files look terrible. This varies from DLNA server to DLNA server. Have you had any troubles like this with various files, or can you offer any tips? The settings in Plex seem quite limited so it looks like however the files playback is how it’s going to be. The only files I’ve had trouble with were 1080p files over 4gb. The rest it handles without a problem. There may be some plugins or hacks to make it better though. at least in my case, I:\Incoming is wrong, but \\LION\My Book (L)\Incoming is right (with LION being the name of the remote computer. Just thought you might like to know how I finally got it all worked out, and also wanted to thank you again for all your help. You were one of the very few people to take an interest in my troubleshooting and provide helpful information. P.S. Plex was very slow on my system, so I’ve gone with Serviio, but still appreciated the suggestion. Great! I’m glad you got it sorted out. I’ll also add a note in my main post about the accounts without passwords. Maybe it’ll help someone else out as well. And no problem! I have a wireless home network in which my laptop runs Windows 7 x 64 Home Premium edition; a Freecom wireless network hard drive that contains media files and folders (this drive is mapped to drive letter Z in Windows, and the laptop has no troube interacting with these files on the Freecom drive); Samsung C series television that also has a wireless network connection. Currently, TVMobili is installed on my laptop streams and effortlessly streams media files from the Freecom drive to the TV. It works perfectly. I have just found Serviio, and I desperately want to use this instead of TVMobili because it offers several features that I really want to us. My problem is Serviio for some reason will not read the files on the Freecom drive, even though TVMobili does. So what am I doing wrong? I’ve read this forum, and several others, quite thoroughly; I’ve read the Wiki and the FAQ, and still no success. The TV sees Serviio’s presentation folders, but there is nothing in them. I’ve also read about configuring the service to run under my user I.D. This is a bit complicated for me because I’m not sure what user I.D. or password to use. I do have a Windows screen saver password, and I entered that for Serviio on the Services folder, but that didn’t work either (BTW..I’m THE Windows administrator so I would assume that I am authorized to share files). Also, I’ve deactivate the LimitBlankPasswordUse in the registry. Is there something else that I am supposed to enter here? What else am I supposed to do??? I would really love to use Serviio, so any step-by-step advice would be greatly appreciated! Read the comments, that have been posted here. You may find your answer. 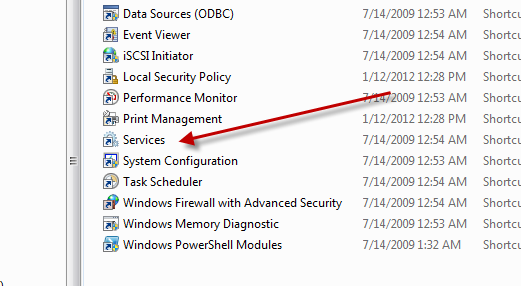 Being “THE Windows administrator doesn’t mean that your Windows services run as you. They generally run from a “SYSTEM” account. This account doesn’t know about your share. Shares are user specific. Your administrative user maps the drive, but other users on the system have totally different configurations for mapped drives. You should pay close attention to the comments from Erik. He found that his problem was the security on his Windows account and the fact that it didn’t have a password. Screensaver passwords don’t necessarily equate to a password on your Windows account. Unfortunately, I am running Windows 7 Home Premium edition, and it doesn’t provide access to the Local Security Policy in the Control Panel. I have already edited the registry key “LimitBlankPasswordUse” (and it is still that way). Is it an idea to delete my Windows password??? Hit the Windows (start) button and type in Local Security Policy. You should be able to get to it from the search results that show up. The idea is to make sure you have a password set on your account and to make sure that you’re running the Serviio service with that account so that it can access your network shares correctly. Hope that helps. Thanks. Tried that. Still can’t access Local Security Policy. My problem remains unsolved. Anyone else have a suggestion as to how I could get this to work. Really want to see Serviio working!! Thanks. 2) Set the serviio service to use your user account, not system. 1) To set a password there is a couple of methods, easiest would be to Right-click Computer and choose Manage. Under Local users and groups open Users. Find your user account (not Administrator or Guest) right-click and choose Set Password. Enter something you will remember and hit OK.
2) Still in Computer Management, move down to Services and Applications and open Services. Find Serviio and double click it. In the Logon tab, choose the “This Account” radio button and enter the username and password you set in step 1. Hit OK. If it still doesn’t work the problem may lie elsewhere. Hope this helps. Hello, just wanted to share that creating a password for my user account was the key. Thanks for the sharing Eric, you’re my hero! This information should really be added to the instructions of the program.